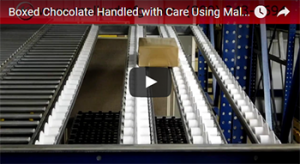 We’ve handled a lot of important and delicate product over the years in our pallet flow rack and carton flow applications, but frankly what is more important than chocolate? 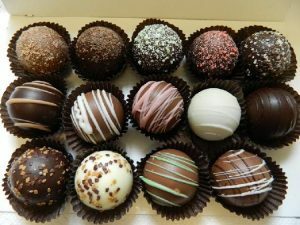 Really, really good chocolate too. So when our testing lab was provided with customer supplied product, we knew we had to find an efficient and safe delivery method for this precious cargo. Flo-Guide flanged wheel carton flow seemed like the best choice. 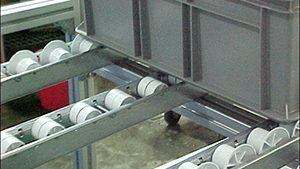 Why flanged wheel?… Well because Flo-Guide is ideal for very deep lanes, tote flow and/or lightweight consistent carton width packages where full length guiding is necessary. Flo-guide specialty ABS flanged wheels are available in multiple configurations and can be customized for individual applications. The ABS thermoplastic wheels are tough and allow for the specialty molding required for the flanged wheel design that makes this carton flow work so well in these circumstances. Box Weights – 5 & 2 lbs. So we could be done at this point, but not the Mallard testing lab engineers… they had to know if stacking the boxes was a viable option. 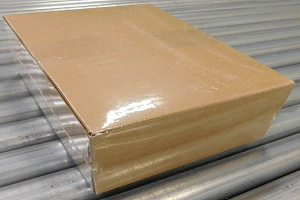 Remember when we said that the packages bowed a bit once shrink wrapped, well because of that the cartons did not sit flat when stacked which caused shifting on impact at the pick face. Stacking the cartons was not recommended, however, a quick test with a tote confirmed that a tote or case could be used in the same system to supply several boxes at the pick face at once if the customer required more product density in the pick lane. What precious cargo are you storing and fulfilling? As you can see we’ve been trusted with the best, so bring us whatever you’ve got and we will work to ensure you’ve got the best designed, configured, and most efficient carton flow application working for you! Give us a call today.